While pre-orders of Apple Watch Nike+ Series 3 began on Friday, September 15th, Apple noted the watch would be available “with limited availability” on Thursday, October 5th in Canada and other countries. So if you’ve been holding off on nabbing an Apple Watch Nike+ Series 3, you can now get them in-stores. In-store pick up is available and the watch is showing as available in most Apple retail locations. 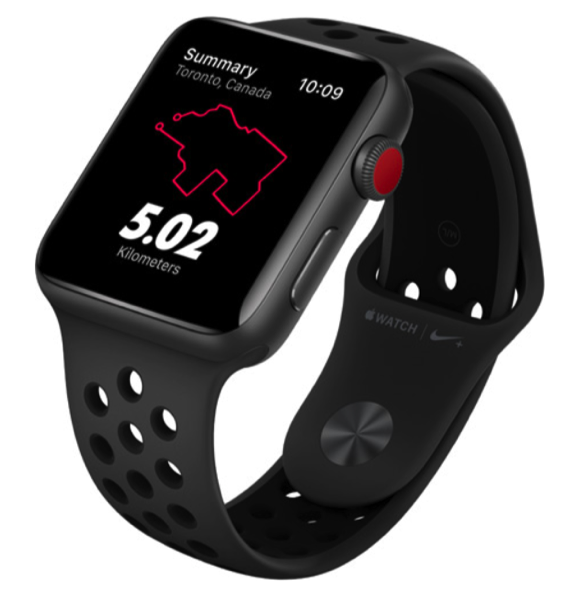 Apple Watch Nike+ models are priced the same as other Apple Watch Series 3 models (starting at $429 CAD), but come with their own distinct sport band and exclusive Nike watch faces. Also new this year is the Nike Sport Loop band, a lightweight band made from “over 300 threads and five different yarns,” which “form a double-layer 3D construction that’s soft and breathable, yet extremely durable,” says Apple. In Canada, Bell so far is the only carrier to support cellular Apple Watch models, while Telus is set to launch on December 1. Aside from launching today in Canada and the U.S., the Nike+ model is also available in Australia, Austria, Belgium, China, Czech Republic, Denmark, Finland, France, Germany, Greece, Guam, Hong Kong, Hungary, India, Ireland, Italy, Japan, Kuwait, Luxembourg, Macau, Monaco, Netherlands, New Zealand, Norway, Poland, Portugal, Puerto Rico, Qatar, Russia, Saudi Arabia, Singapore, Spain, Sweden, Switzerland, Taiwan, Thailand, Turkey, UAE, and the UK.